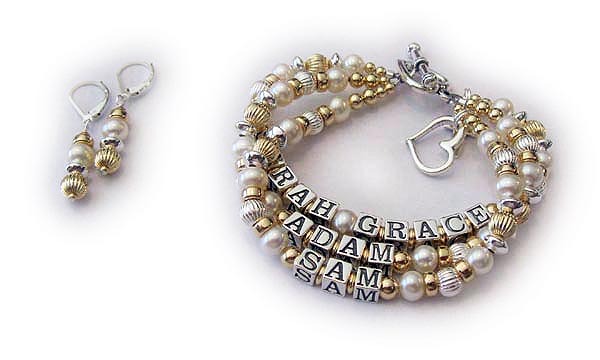 Picture: 3 string bracelet with 3 kids' names They picked the 3-string bracelet option for CHASE, CARSON and CHLOE and they added 2 things to their Pearl, Bali and Gold Mother Bracelet: a Beaded Toggle Clasp and a LOVE Filigree Charm. They added 3 things onto their Pearl & Gold Mother Name Bracelet... an Open Heart Charm, Heart Toggle Clasp and Earrings. They added 3 things to their 2 string / 2 name Gold and Pearl Mother Bracelet: February Birthstone Crystal Dangle, July Birthstone Crystal Dangle and a 14k Gold-Plated Lobster clasp. 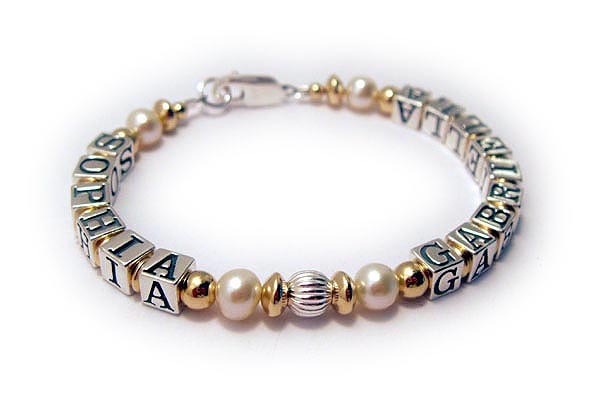 Two names are shown on this 1-string Gold, Pearl and Bali Mother Bracelet. The kept the beautiful simple free lobster claw clasp. This is a 1-string Gold, Pearl and Bali Mother Bracelet with 1 name. They put MAMA with the optioanl but free birthstone crystals before and after MAMA and added a January Birthstone Crystal Dangle to their order. It is shown with my free Twisted Toggle clasp. They picked the 3-string bracelet option for CHASE, CARSON and CHLOE and they added 2 things to their Pearl, Bali and Gold Mother Bracelet: a Beaded Toggle Clasp and a LOVE Filigree Charm. This Pearl, Gold and Bali Mother Bracelet is shown on a gold 4-string slide clasp. I recommend a slide clasp with 3 or more strings but you may choose any style clasp during the ordering process.